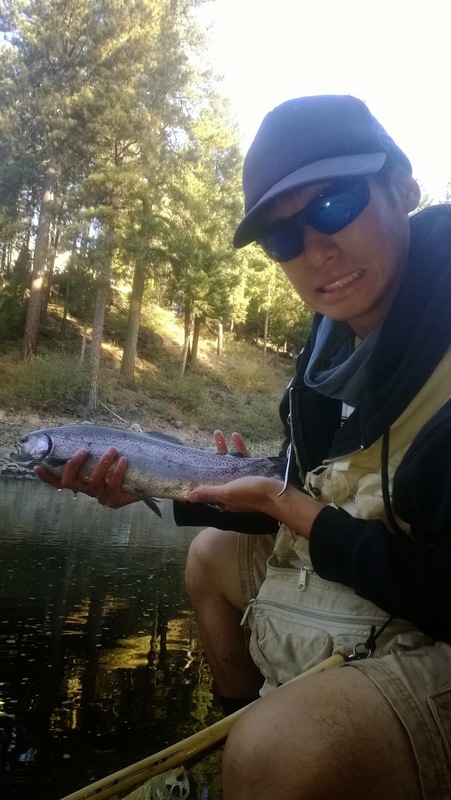 California is without a doubt in a drought and the fish are really feeling it the most. 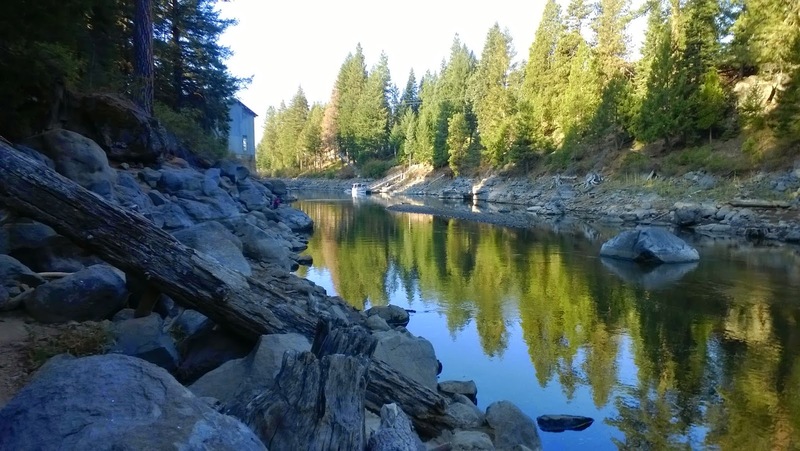 Hamilton Branch at Lake Almanor is an outlet that releases cold water to the lake. In late summer to fall the fish are literally stacked at the mouth of Hamilton Branch. I was told by two people that the fishing was awesome and like anyone else I was excited to check it out and catch some big fish. This trip was not what I was expecting. I woke up at 4:30am and left Chico at around 5:00am to get to Lake Almanor. The drive was pretty quick and I managed to get there at around 6:30am. I've never been to Hamilton Branch before so I didn't know what to expect. There was a parking lot access along Hamilton Branch that I parked at and after gearing up I hiked down the trail. The outlet to the mouth of the lake was about 150 yards and the water in this area was pretty still. The banks were lined up with about 5-7 anglers. I had heard a report that the fish were on midges so I rigged my fly rod with a blood midge pattern and started casting. Wanting to avoid the crowds, I explored upstream a little bit only to find that there weren't any fish around. While wading through the water and pushing bushes away, I saw that the area was heavily fished as fishing line, garbage, cups, and bait littered the banks. That was the first red flag. 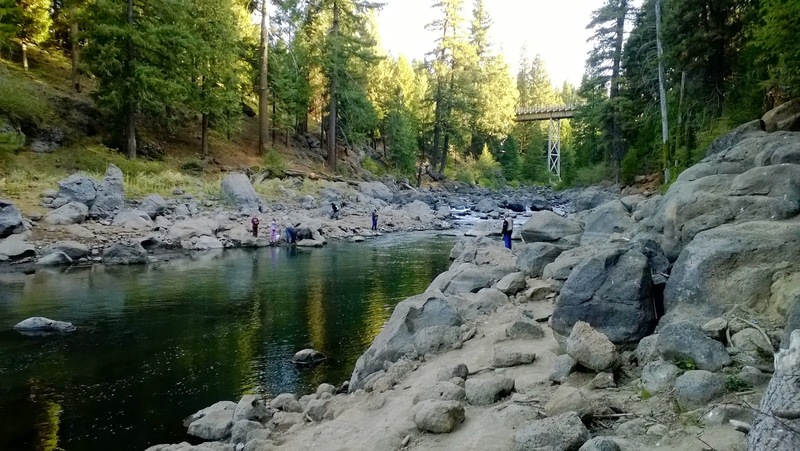 After finding nothing upstream I waded back down to where everyone was fishing. To my surprised there were hundreds of fish all 16"+ just holding in water that was probably about 3 feet deep at the most. After I set up and switched through a few flies, I finally hooked a nice 16" fish. Now I know what an 16" bow should feel like, they run your line, fight hard, and you had better set the drag. This fish hardly pulled any line and I was able to strip it in super easy. Second red flag. The fly came off after I landed it so my first fish was a quick release. There was no fight left in these fish and there were so many of them there's was no sport in it. I made the call that I'd catch one more and then I'm out of here. Only about an hour had past. Not five minutes later I hooked another 16" bow. I was using 6x tippet and a size 18 hook so it gave the illusion that the fish was fighting harder. Being the only fly angler it seemed like I was the only one hooking into any fish. There were about 14 anglers fishing now and it started to get a bit crowded. I landed the fish with no problem took a few photos and noticed that the fish had a hook still stuck in its mouth. Third red flag. While handling the fish, I noticed that it's belly had some red sores on it but overall it was still a good looking fish. When I finally revived and released it I took apart my rod and left. Now I'm not a PETA activist nor do I think catching and eating fish is wrong, but there is a time when we as anglers need to draw the line between when its right and when its wrong to fish. If you're a fly angler looking for a good fight then look elsewhere. Leave these fish alone and come back in the fall. Don't exploit nature. These fish need the cold water to survive and they wouldn't be here if they didn't have to be. Hamilton Branch fish were lethargic and just plain sad. Shooting fish in a barrel isn't as fun as you'd think. I just left and didn't look back. Poor fish. that's a pretty sad situation there. Then again, its pretty sad all over!